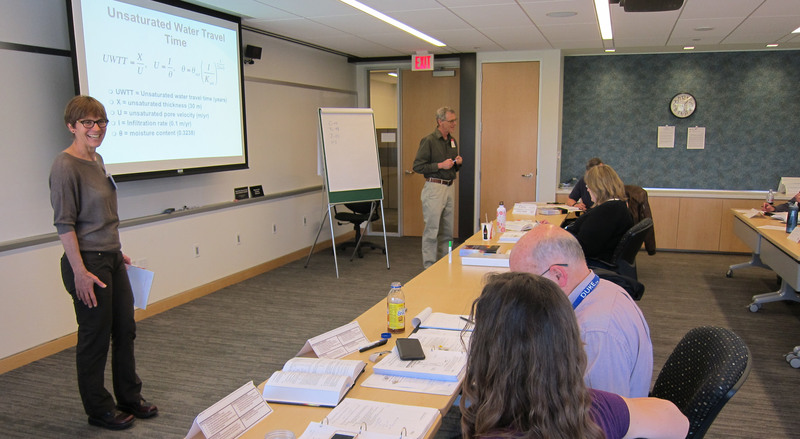 RAC is currently contracted to present up to five one-week training courses on risk assessment for the U.S. Nuclear Regulatory Commission (NRC) through 2019. RAC presented the most recent of these courses to NRC staff from May 8 through 12, 2017, at the NRC Professional Development Center in Rockville, Maryland. The first training course under this contract was presented to NRC staff from April 27 through May 1, 2015, at the same location. RAC had previously presented a similar training course to NRC staff in 2009, under a separate contract. RAC’s lectures, discussions, and demonstrations for these courses are designed to allow participants to use the acquired knowledge for performance evaluations of licensee environmental assessments and to perform environmental impact reviews, inspect licensee programs, and manage environmental projects. The scope of material includes techniques used for conducting source term modeling for air, soil, groundwater, and surface water releases; exposure pathways, including direct radiation, ingestion, inhalation, and submersion from releases of radioactive materials to the environment; methodologies used in conducting transport modeling, including a performance assessment framework; techniques used to conduct parametric sensitivity and uncertainty analyses; dose conversion factors; and development of sampling and analytical methodologies used for confirmatory analysis.